is the worldwide first and complete Tuning-Solution for your BMW with ZF6HP automatic transmission. After 1.5 years of community driven development here on E90Post.com and some more 6 months and thousands of additional development hours, we are proud to announce the first all-in-one solution for BMW 6-speed automatic transmissions. xHP Flashtool put's the power to fully customize your automatic transmission at your hands. 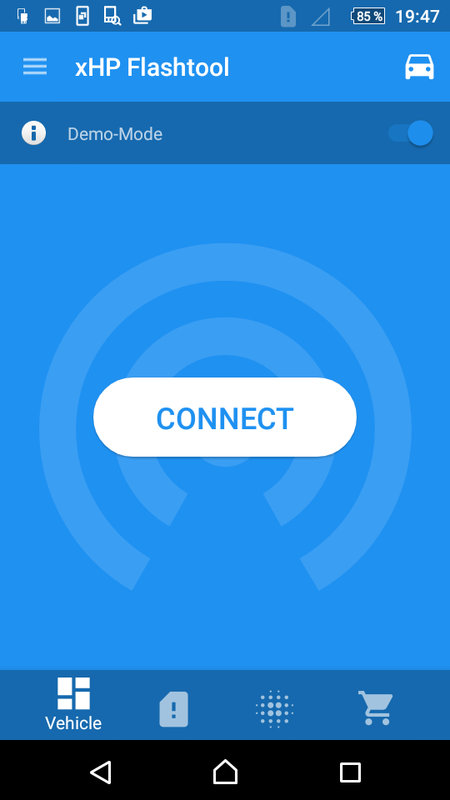 Connect your Android smartphone to your car and customize around 100 maps by yourself or choose from pre-defined OTS maps in the xHP in-App Store. 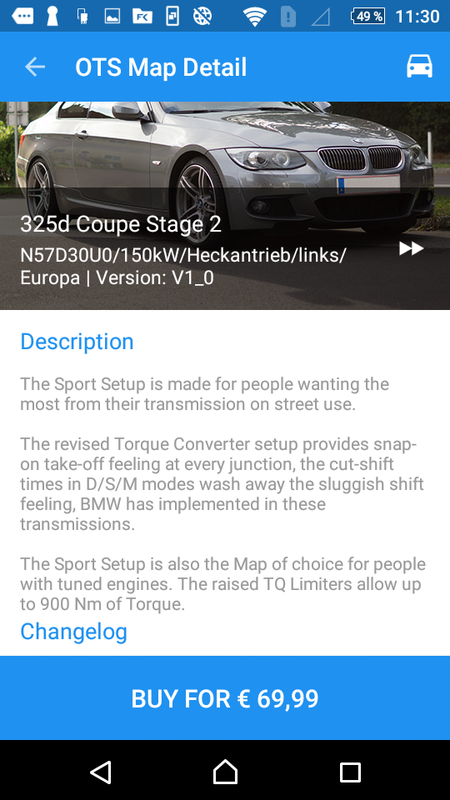 Ability to flash your transmission controller (TCU) on your BMW with custom files. The flash method is 100% safe. The TCU can always be restored to a working state, even if the cable get's pulled during a flash procedure. Choose from pre-defined maps in the xHP InApp-Store and customize them further with our powerful in-app Editor functions! Switch between maps in 2 minutes. Pricing: 119 USD for the main flash license, which enables you to do as many custom flashes as you want. The OTS maps will range from 49 - 89 USD, depending on type and vehicle. Or you can choose the "Super License" for 249 USD, to get everything in one sweep. This offers a price-advantage of 77 USD over single purchases. xHP supports up to 3 cars per device and Google account. Don't want to flash your car by yourself? Don't want to read into the details? You have no Android device? No problem. Search our dealer network, to find someone do the work for you! Gear Display in Dash in D/S/M Modes"
Q: Can I test xHP before buying anything? A: Yes. The download of xHP is completely free. 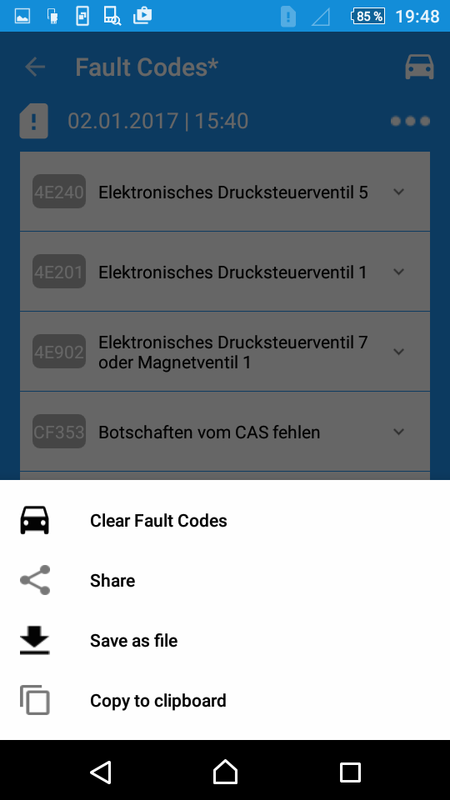 You can do a full read of your TCU and read/delete fault codes without any license. Q: May I return to stock any time with xHP? A: xHP creates a full backup before attempting any flash procedure. You can flash back your original file at any time. Q: Do I have to connect my Android device with xHP to my car all the time? A: No. You only need to connect, when you&amp;#8217;re flashing, or reading data from your vehicle. During normal driving, you don&amp;#8217;t have to have a live connection, or even carry the device with you. Q: I&amp;#8217;m going to sell my car. May I re-use my bought License on my next vehicle? A: Yes. Just uninstall xHP before giving away your car. You can then connect your License with your next vehicle. Q: How do I check if my vehicle is supported? A: The best way is to download the xHP app and connect it to your vehicle. xHP will tell you instant if your vehicle is supported. Alternatively, you can head to www.xhpflashtool.com and check our vehicle list. We do our best to keep this list as correct and up-to-date as possible. 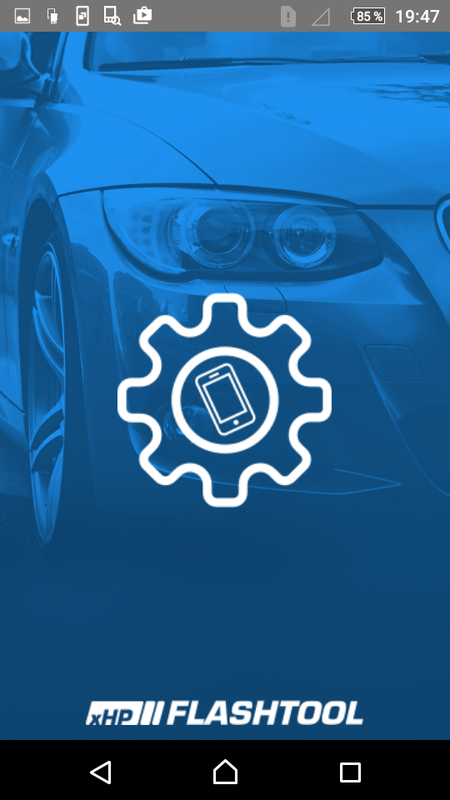 However, BMW changed TCUs regularly during the production lifecycle and there may be cases where your vehicle is on the list but still not supported. These cases are rare, but cannot be avoided 100%. Q: How about reliability, will I shorten the life of my transmission using xHP? A: OTS Stage 1 and Stage 2 setups won&amp;#8217;t have any effect on the lifetime of transmission components. Not on the TCU, nor on the shafts or clutches. Keep in mind, that automatic transmissions are highly complicated units, with a few hundred components inside. Some of these components are designed to wear out (like clutches) through making use of them. Your driving style and proper maintenance have the biggest impact on the life-time of transmission components. Stage 3 files remove limiters and safety measures and therefore the driver is responsible (like in a manual car) for taking care of his transmission. Besides that, there are no negative effects on transmission lifetime to be expected from Stage 3 files. Q: Am I allowed to change between different OTS and custom tunes? A: You can switch between tunes as often as you like and you are allowed to buy multiple OTS tunes and manage them on the same device. Q: Am I able to log data with xHP? A: We're working on an additional logger module, which will be released during 2018. Q: I'm running an Alpina flash currently, do i have to revert to stock before using xHP? A: No. xHP saves the Alpina flash as backup and then overwrites it. Q: Is my car supported right now? A: Those are supported to. If you have additional questions, feel free to ask here directly, shoot us a PM, contact us through our Website or follow us on Facebook! Last edited by RBT-Tuning; 01-28-2019 at 01:09 PM. Will this work with the 6HP19 in a pre-03/07 335i? No love for the gm trans? I know it has a different tcu but please please please do something for the early 335i!! Please! I wouldn't exclude it forever, but theres nothing in the pipeline for the next 6 months on that. That's a totally different project. Sorry. But regarding the build date, there seem to be cars in the market built pre 3/07 with the new TCU version. I can't nail that down exactly yet, but as we gather more data from the market we will know what cars got the new TCU version when exactly. Is there still time to become a beta tester? My trans slips on E40 when im putting down 525whp. It holds around 4-450whp now that im detuned. I would like to give this a try if theres some chance it could help this issue. Thanks! Sorry, beta for N54/N55 is closed already. No worries, ill be looking forward to it in March. Does this flash have any effect on transmission torque limits? Or will it still be similar to Alpina but with different characteristics. Torque limits will be raised on OTS maps. Race with "no" limit. I have a question about current tuning for our transmissions. From what i know, people are already manipulating line pressure and shifting characteristics. Ive had my trans slipping issue fixed through email tuning and was told the "torque load limit" wasnt adjusted high enough or something. Was i being lied to or can people already adjust line pressures today? If so, how is this different? Last edited by natedog7700; 01-31-2017 at 02:07 PM. I have a question about current tuning for our transmissions. From what i know, people are already manipulating line pressure and shifting characteristics. Ive had my trans slipping issue fixed through email tuning and was told the "torque load limit" wasnt adjusted high enough of something. Was i being lied to or can people already adjust line pressures today? If so, how is this different? Currently, transmissions don't get tuned. But to a certain degree you can trick the transmission by sending false torque values from the ECU. If you are asking can line pressures be manipulated, the answer is a qualified yes. It cannot be done strictly mechanically, because the TCU will either learn it's way around the mod or issue a DTC. No disrepect, but properly tuning a clutch to clutch shifted transmission is way more than adjusting pressures. I think the biggest difference with the xHP is the control it gives the operator. Second, if your tuner isn't modifying the calibration of the TCU, then they may be implementing a band-aide fix. Finally, there is something bigger going on here. This started as a community led effort and we are fortunate that someone has championed a service that essentially makes TCU tuning (not the flashing method) open source. That means things aren't secrets - the situation are have found yourself in. Well, licenses will be tied to the VIN, so you have to buy License & Maps separate for each car and the first release will only support one vehicle per device. 1) Yeah thats what i was asking, im not to familiar with the coding side of things so it gets quite confusing to some like me. 2) My trans would start to slip after repeated runs over 500whp Do you think the TCU is "learning" or more of a mechanical side of things? Over heating causing the clutches to slip? It was so weird. After i flashed my MHD it would grab fine but back to back runs it would start to slip again. So odd. How we can check our TCU version? You can check it through the BMW tools (Inpa, Tool32 etc), at the dealer, or through xHP then. X3 will follow somewhere in 2017. Shop is ready, OTS Maps are ready. Beta will start in the next days! We've released the prices yesterday on Facebook! Last edited by RBT-Tuning; 02-10-2017 at 09:48 AM. Exactly. Or you can play around by yourself and find your personal best cal. For that, the general license is enough. No cal will compromise daily driving in D mode. Sport and Race are fully useable for daily commute in D. It's just that there is a bigger gap between D and S/M mode in the Sport and Race cal.